Aaron Donald had yet another big day rushing the passer, beating J.R. Sweezy several times, and coming up with three sacks in the game along with a few other hits and hurries. That gives Donald 13 sacks on the season, matching his total from all of 2017 in just 10 weeks. In his second game as a Ram, Dante Fowler didn’t get to the quarterback much, but he did had one of the biggest plays of the game with a strip sack of Russel Wilson and managed to recover the fumble as well to set Los Angeles up with excellent field position. The Rams take a two-score lead just a few minutes later to help push the game out of reach for Wilson & Co. It was more of the same for Todd Gurley and the Rams’ rushing offense. Gurley showed great speed and the ability to find creases in the Rams’ zone rushing scheme. Gurley also kept his touchdown streak intact while accounting for more than 150 yards from scrimmage. The Rams supplemented their rushing attack with chunk plays passing the football. Jared Goff was extremely accurate on the day, as he only missed a few throws that weren’t thrown away. It was not the most productive passing night for Wilson with just 176 passing yards, but he did throw for three touchdowns. His biggest impact came as a runner, whether it was by design or just scrambling, as he gained 92 yards on nine carries and picked up nearly as many first downs. Seattle ran the ball well overall thanks to a mix of good blocking and great running back play. Rashaad Penny saw his most playing time of the year and had his first career 100-yard rushing performance despite getting just 12 carries. Mike Davis added another 58 yards, averaging 5.3 yards per carry. There was not a lot of great play by the Seahawks’ defense against the high-octane Rams on Sunday. One thing that can be relied upon week in and week out is Bobby Wagner’s ability in coverage. Wagner was again outstanding in that area, but he struggled a bit in run defense. Goff found receivers with relative ease, and this can be put mostly on the shoulders of the Seattle secondary. While the pass-rush was slowed by the Rams’ rushing attack, Seattle defensive backs gave up a good amount of separation to Rams wide receivers consistently and made for some easy throws for Goff. Goff’s ability to distribute the ball to the open receiver evenly and efficiently makes this offense run at its absolute best, and he was doing just that on Sunday. 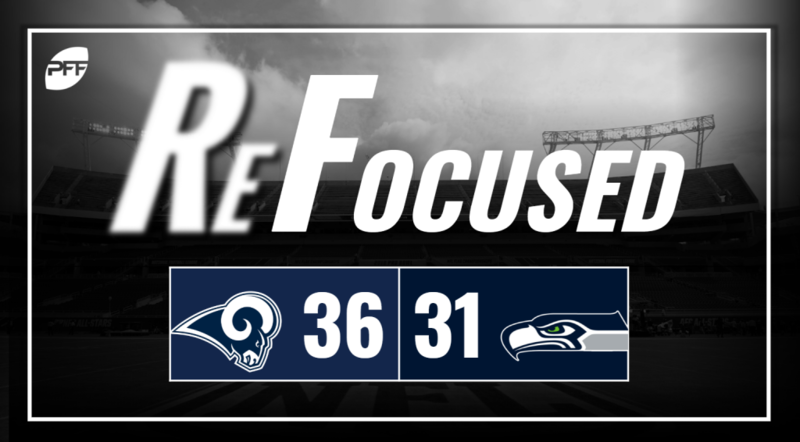 Seattle tied a season-high 31 points scored, but ultimately couldn’t keep up with the Rams’ offense and came up just a few points short, similar to their first meeting in Week 5.